Big white beans are delicious and satisfying. This dish truly highlights that yumminess! Bring a pot of water to a boil with a pinch of salt. While waiting to boil, heat a stainless steel skillet. When warm, add oil to the skillet followed by onion. Add pinch of salt and sauté on medium heat for 2 minute. Place onions in bowl. When water is boiling, blanch carrots and place into bowl with onions. Add mustard and lemon juice to taste to the onions and carrots and stir. Add dill, scallions and beans and stir mixture gently so as to keep the beans whole. Serve warm or cold. This dish will keep well. 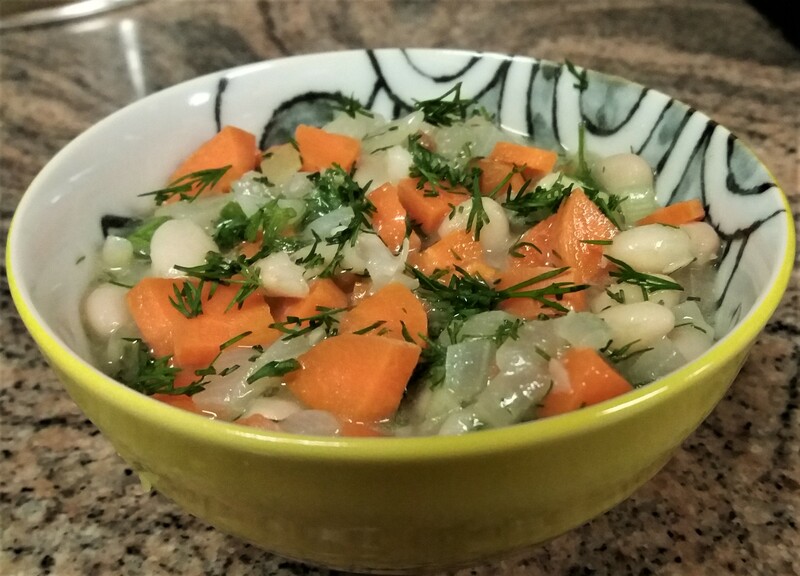 The blanched carrots lighten the dish but if it is winter and you want it a bit heavier then sauté the carrots with the onions rather than blanching them.